Going on a big trip this summer? Whether you’re going backpacking through the most Instagram-worthy locales of Europe, or opting for a relaxing stay-cation back home, your best companion will be one of Canon’s lightweight, reliable EOS cameras. 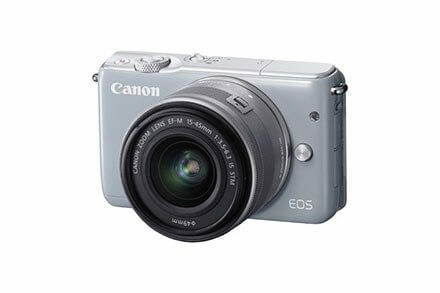 Canon’s EOS M10 EF-M 15-45mm f/3.5-6.3 IS STM Kit Gray camera will be convenient to carry with you at all times, and not pose a heavy burden when you’re checking out new sites and scenes. We all know that person — the one who brings their loud, clunky camera to a beautiful natural attraction and ends up ruining the moment for everyone. Fortunately for you, the EOS M10 is constantly working to reduce image noise, which means your camera won’t be a distraction to those around you and take away from the scene your photographing. The 18.0 Megapixel CMOS sensor also takes photos in high-resolution, and with an ISO range of 100-12800 (which is expandable to 25600), you can capture details both in broad daylight and the dark of night. When you’re watching a performance or live event, the last thing you’ll want to do is waste time desperately trying to get your camera to focus. The EOS M10 camera comes with Canon’s Hybrid CMOS AF 11 autofocus system to greatly minimize any effort on your part to get your subject into focus. The autofocus system is able to measure up to 49 different areas of an image, and focalize important points with speed and accuracy. Face detection and object tracking also assist in focusing on moving subjects — a key feature for events like lively soccer games or dance recitals. There’s nothing worse than coming home from an exciting event and realizing that despite your best efforts, you failed to get a good shot. If you subscribe to the mantra “picture or it didn’t happen,” you’ll be quite pleased with the EOS M10 camera’s ability to preview images. The camera has a 3.0-inch touch screen with 1.04 million pixels, which can provide a preview of photos you take in the highest detail. What’s more: you can turn the screen 180 degrees, allowing you to capture scenes from a unique, unexpected perspective. The EOS M10 is also incredibly user-friendly, which is ideal if you want to spontaneously lend the camera to a friend or family member to snap a photo of you. The camera has a simple, uncluttered menu design and is easily responsive to the touch. If you want to focus on a certain point in your photo, all you have to do is give the image a slight tap. Moreover, if you’re pressed for time and need to ensure you’ve taken good photos, you can use one finger to easily swipe through the pictures you’ve taken. Now, with the Best In Glass Sale, you can get the EOS M10 EF-M 15-45mm f/3.5-6.3 IS STM Kit Gray for only $549.99 — just in time for all your summer adventures. This article was published in Technology and tagged Cameras, Canon.